"It's no accident that we're unusual and unexplainable," Chip Morgan admits. Clad in canvas and flannel, he doesn't look like an underground enigma. But he flashes a sly smile as he leans back in his chair at the console of WMUD, the 90,000-listener-strong radio station that happens to be headquartered next to his Bridport kitchen. Meanwhile, the speakers emit "Another Lucky Day," by Vermont singer-songwriter Patti Casey. Morgan remarks that the song was recorded in this very room a few weeks before. Talk about operating on another wavelength. But for Morgan and his wife Kathy, it's commercial-free business as usual. At 89.3 FM (or http://www.wmud.org for the stream-inclined), this 24-hour station - a.k.a. "Mud" - has been intriguing listeners across the Champlain Valley and the Internet since 2003. And thanks to the on-site solar grid and wind turbine, WMUD's console powers itself. Morgan looks out the window as a truck pulls into his driveway. "Oh," he says, "the guy from the slaughterhouse is here." That would explain the herd of Black Angus cattle roaming his lakefront property. Wood Creek Farm is the Morgans' other 3-year-old business venture. As a Vermont Fresh Network partner company, Wood Creek supplies more than 25 Vermont restaurants and institutions with top-quality, pasture-raised beef. Since WMUD went on the air, the Morgans have divided their time between meat and music. Mud styles itself as a "quite contrary" station, but it's not just singing the usual anticorporate, alternative-media tune. "We call WMUD 'farm fresh' to give a potential new listener the idea that our programming is fresh and local . . . unlike much of what's available elsewhere," Morgan says. "Vermont has a long history of intelligent independence." But the adjective "alternative" doesn't do justice to the scope or commitment of his aural enterprise. "The station is designed for people who are burned out on regular radio stations, for musicians and for people who enjoy a wide variety of music," Morgan explains. "We want to expose listeners to songs they might not have paid attention to before." As a result, WMUD boasts listeners in Vermont and New York whose tastes straddle the line between homey and esoteric. 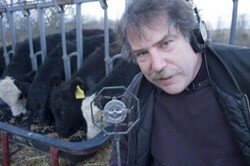 The station plays on radios in dorm rooms, milking barns and loading docks in the Champlain Valley and the neighboring Adirondacks. "When I start at 3 a.m., the tunes and strong coffee help get me moving," writes WMUD devotee Frank Beardsley, owner of Seneca's Bakery in Crown Point, New York. Mud's methodology comes in loud and clear. In any given 10 minutes, programming runs the gamut from Patti Griffin to Garcia-Grisman to The Gipsy Kings. While there's no station aesthetic per se, Morgan describes the repertoire as "acoustically oriented" - that is, rooted in but not limited to jazz, folk and world-music genres. With no live broadcasts or commercial interruptions, the station offers a holistic listening experience. "This music forms the soundtrack of our lives," Morgan says. Nodding at his pasture, he explains, "As quickly as the weather, your mood or your environment changes, WMUD's music changes." He notes approvingly that one enthusiastic listener even told him Mud resembles a "musical compost pile." Like any organic project, WMUD emerged from a close working relationship with the landscape - or, in Morgan's case, the mediascape. He grew up on an "old, run-down farm" near Saratoga, New York, and graduated from Skidmore College, then found work in the radio business. Morgan worked as a DJ or general manager at stations in central Pennsylvania, Washington, D.C., San Francisco and Sacramento. In 1989, he founded CMBE, Inc., which provides programming and engineering consultation to radio stations across North America and Europe. Morgan has cut back on the consulting work. His farm "functions as an alternative to our fast-paced entertainment business," he says. "We can walk outside the office, get away from the computers and telephones and have a real relationship with our animals and neighbors." Morgan likes a good jam, too. "I used to sing in barbershop quartets and little theater musicals, play baritone horn in high school band," he says. "I play piano at home, play guitar and banjo folk music. Kathy used to sing and loves all kinds of music. Now we play music all the time - but it's on our radio station." If music is the "soundtrack" of the couple's life together, then "community" seems an apt frequency. By featuring artists such as Grace Potter (Waitsfield), Anaïs Mitchell (Montpelier) and Banjo Dan (Vergennes), the Morgans do their part in maintaining a healthy regional music scene. In the same vein, Morgan is raising money for what he calls the Champlain Valley Music History Project - a collection of recordings by and interviews with local musicians to preserve and document sounds of the area. Morgan pushes preservation of another sort as president of the Lake Champlain Restoration Association. Since 1999, that consortium of property owners and sportsmen has been fighting to maintain the lake's ecological balance, principally by eradicating milfoil, an invasive weed. "So we're trying to clean up the air and the water," he says with a chuckle. WMUD underwriters are an odd assortment, including Middlebury's In the Alley bookshop, the Ripton Community Coffee House and Shoreham's Golden Russet Farm, to name a few. That list suggests Mud is already mucking around in the hearts of a quirky cross-section of local residents. With a little advertising, the station's possibilities could be as wide as the view from the Morgans' living room window. Live performances, political coverage, talk shows? Morgan laughs at the idea. "We certainly appreciate every contribution, but we are barely covering operating costs," he says. "We couldn't possibly afford DJs with talent equal to our musicians, and to do anything less would reduce the quality of the station. Specialty programming is expensive, and this isn't New York City." Instead, he and Kathy prefer to keep it simple, even if their laid-back posture abets their relative, albeit blissful, obscurity. As long as they receive enough listener donations - it costs them 0.07 cents per minute whenever listeners stream online - they'll be happy as pigs in mud. So don't expect any DJs or commercials in this pasture. Just like the Vermont landscape it celebrates on its airwaves, the basic look and feel of WMUD won't change any time soon. Mud marches to the beat of a mellower drummer, and the Morgans won't sacrifice quality - or eccentricity - to woo high-profile sponsors. "The station is designed to appeal to a wide variety of listeners from all walks of life who share a fairly uncommon appreciation of non-hit music," Morgan affirms. All the same, the Morgans have a few improvements in mind. In the near future, they hope to expand WMUD's coverage area: Currently, the signal peters out north of Vergennes. And they'll continue to beef up their repertoire of local musicians. Shouldering a barn coat, Morgan steps outside and climbs onto his tractor. The delivery truck has just left a few hundred pounds of prime cuts in the driveway, so he'll need a forklift to move the shipment into his enormous refrigeration room. He admits it's harder than he anticipated to see his cows come back as steaks. But Morgan takes pride in giving his animals a good life until then. "Food and music," he says, "are both nourishment for the soul, and we sense a growing appreciation and a need for those things - for ourselves, and for the greater good of mankind. It may sound crazy or self-serving, but as Kathy and I grow older, we look for ways to help others."